What seems to be an unfair review of Facebook’s marketing platform by respected research firm Forrester has been making the media rounds. In an open letter to Facebook’s CEO Mark Zuckerberg, Forrester’s vice president and principal analyst Nate Elliot takes aim at the social network’s value for marketers. With the opening sentence, “Facebook is failing marketers,” Elliot delves into why Facebook has been a less than stellar social platform for these folks. Citing a Forrester survey of 395 marketers and executives at large companies located in the U.S., Canada and the U.K, Forrester was told by the sample that “Facebook creates less business value than any other digital marketing opportunity.” Yikes. In fact, according to Forrester, out of 13 different online marketing strategies and sites, Facebook came in dead last, with a satisfaction score of 3.54 on a 5-point scale. The reasoning for the apparent disappointment is two-fold. For one, Forrester points out that Facebook isn’t good at driving engagement between businesses and their customers. “Your sales materials tease marketers with the promise that you’ll help them create such connections. But in reality, you rarely do,” the report states. Backing up that remark, Forrester claims Facebook, on average, only displays a brand’s posts in 16 percent of its fans’ newsfeeds. Secondly, the site is focusing on traditional, web 1.0 display ads, with less than 15 percent of its ads utilizing social data to reach a more targeted audience. Sound points, but when you get down to the methodology, I am not how much stock I’d put in Facebook being a disappointment to marketers. Keep in mind Forrester only surveyed 395 companies, which might not serve as a big enough pool to provide such a blanket statement that Facebook is failing marketers. Also, Forrester didn’t disclose the companies they surveyed, stated the sample was not random and the respondents were rewarded for their information. Plus, Facebook’s satisfaction score of 3.54 is 0.3 points away from first place, which could have more to do with a statistical error and less to do with dissatisfaction. The findings also don’t seem to be deterring businesses from jumping on the Facebook bandwagon. According to the report, Facebook brought in $4 billion in advertising revenue last year and 79 percent of businesses market on Facebook. 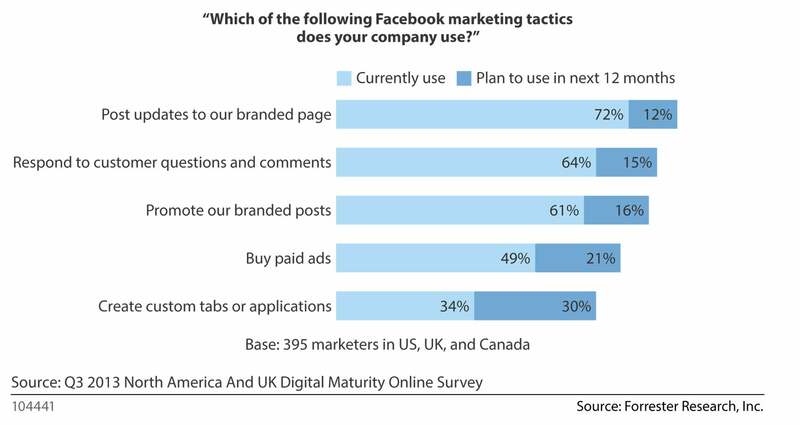 Also, many of those 395 companies surveyed for the report do, or plan on using various Facebook marketing strategies. To add to that, Adobe released its first annual Social Media Intelligence report and ad clicks, impressions and marketer’s return on investment all increased from 2012 to 2013. The social network’s ads were clicked on 29 percent more in 2013, return on investment jumped by 58 percent from last year and click-through-rate was up a whopping 275 percent. Also, Google, a company some may state is an arch enemy of Facebook, deciding to partner with the social network and sell its ads on Google DoubleClick Bid Manager. But Forrester cautions that Facebook better get its act together or the future may not be so rosy.